NEW YORK Heinz (HNZ) CEO William Johnson is entitled to a golden parachute worth $56 million if he's fired by the company's new owners. Warren Buffet's Berkshire Hathaway and 3G Capital announced last month they were buying the ketchup maker in the food industry's richest acquisition ever. Pittsburgh-based Heinz, which also makes baked beans, vinegar, Classico pasta sauce and Ore-Ida potatoes, disclosed Johnson's deal in a regulatory filing Monday. The deal lets him walk away with $40 million at any time if he chooses. He would get another $16 million if the new owners were to let him go. In addition, Johnson is entitled to a payout of $99.7 million in vested stock and $57 million in deferred compensation benefits that he accrued over his 30-year career with Heinz. That means he could walk away with a total of $212.7 million. Heinz spokesman Michael Mullen says the payments reflect Johnson's success in "creating billions of dollars in shareholder value." He said no decision has been made about Johnson's future with the company. Johnson, 64, has been president and CEO at Heinz for the past 15 years. At a news conference announcing the $23.3 billion acquisition last month, Johnson said that, by taking the company private, the deal would give Heinz the flexibility to make decisions more quickly and continue its transformation into a global business. The more Heinz is able to grow, the "safer people will be," he said, referring to their job security. 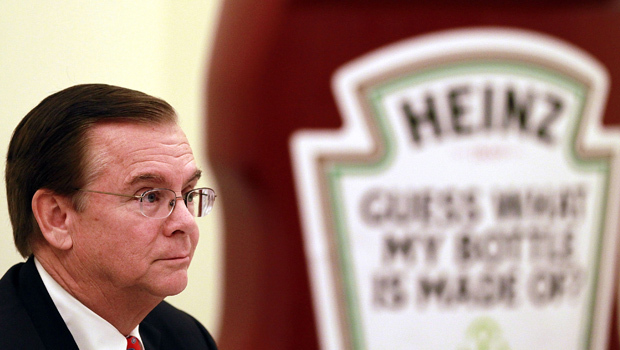 Heinz hasn't made any announcements about layoffs. But 3G Capital, which is best known for its purchase of Burger King (BKW) and its role in the deal that created Anheuser-Busch InBev (BUD), is known for aggressively cutting costs. In the regulatory filing with the Securities and Exchange Commission, Heinz also disclosed that Chief Financial Officer Arthur Winkleblack is entitled to a golden parachute of $15.5 million if he's let go by the company. David Moran, the company's CEO of Europe and Global Infant/Nutrition, is entitled to $15.5 million as well. Those figures don't include vested stock and deferred compensation.